No games till 2013 now, so just a quick post to say a big Thanks to all of you who have viewed - and especially those who Follow my blog! Hope you had a really Happy Christmas! Today (Saturday), was the last club day till 2013, so a 'Beer and Pretzels' game was in order! - Dave from the Napoleonics lot joined us for a Wings of War/Glory game, and Gareth was interested to see what the game was about. Both agreed to join our campaign...so the fight was on! The Germans were a Roland, on a reconnaisance mission, and five Albatros Dvs escorting. These would be run by my solo system. 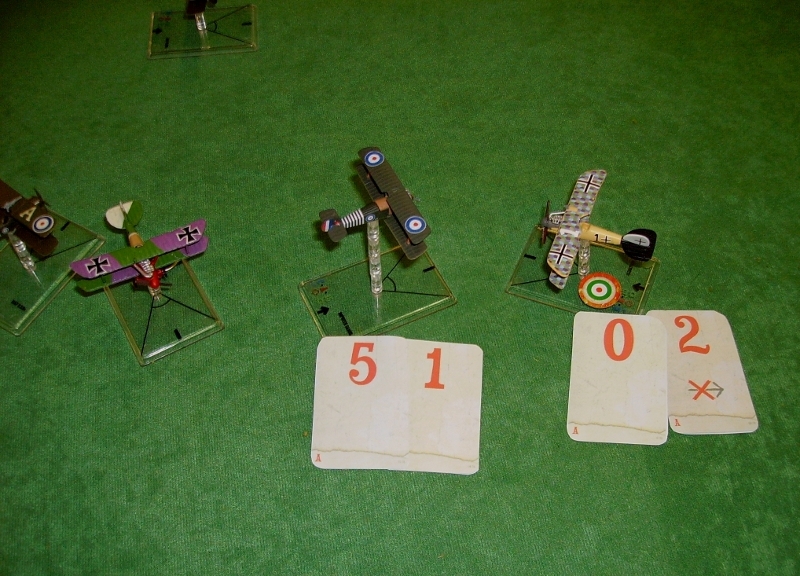 Lawrence decided to fly a Sopwith Camel. The Germans closed, keeping their formation. We manoeuvred to our right, leaving Lawrences Camel facing 3 enemies! The first contact was brutal, but the RFC had the advantage in damage, though Ian's SE caught fire. We passed though each others line, then jockeyed to gain the rear of the Germans. Lawrence weaved in front of his three opponents. Ian's plane managed, despite the fire in his engine to get a long shot. Despite having to dodge two other Albatrosses, a further burst caused more damage. The other SEs and the Germans moved to join the furball! ..but neither side managed a shot as they passed. Lawrence moved to engage the lone Albatross left facing him. The other planes continued turning and shooting. Lawrence managed a shot at his Albatross, before his guns jammed. Both sides broke contact before turning to engage again. Daves SE got the better of a frontal battle with an Albatross. The SEs were getting the better of the exchanges. Ian got another good shot and killed an Albatross. Ian carried on and severely hit a second Albatross. Already damaged, the Albatross fell. Dave and I were meanwhile fighting the Roland. Ians pass continued bringing him near to Lawrence who was losing his fight with the Albatross. Gareth got a good hit on an Albatross that was attacking me. We managed briefly to get 3 planes against one Albatross.. But Lawrence had to turn to fight his original opponent. The rest of us jockeyed for position. Another pass saw the Germans losing the firefights again. The Roland returned and hit my SE. Dave came to my support, but I took a 'Bang' result from the Roland, which, with a campaign rule meant I was wounded severely and took an A damage card each turn till I left the table, If i failed to leave, I would pass out and crash. The Roland rear gunner now hit Gareth. Ian was still circling and shooting! The Roland continued and hit Dave's SE. ..then ran into Lawrence's Camel. My escape failed, and my plane plummeted to earth. Ian, meanwhile, managed to get a third Albatross! So as per the campaign rules, with 50% losses, the remaining Germans flew home. Ian had an amazing personal tally for the day, but he and and the rest of the RFC planes all returned to base with badly shot up machines. At least they survived! Baffling the single minded league! The Ikko-Ikki, defending the village. Ian was in command of the Samurai, and had a 'cunning plan'. Lawrence and me had forces of unarmoured Samurai and Ashigaru, obviously not having had opportunity to visit the local castle where the armour is stored, so were sent in first, to attempt to draw off some of the Ikko-Ikki from the village so the armoured troops could assault the village with weakened defences, our light forces were not to engage in combat with the monks. I therefore deployed my force near the front of the village. ..Lawrence did likewise on the far side. Lawrence got the monks attention with a volley of long ranged fire...which upset the peasants facing them, who charged out to engage! I showed a line of Ashigaru spears to them, and the peasants facing me advanced to investigate. Ian and Phil's force approached to my right, out of sight of the village. One of Lawrences mounted Samurai advanced and got shot at from the village, so wisely withdrew. Lawrence withdrew his Ashigaru as ordered, to draw them on. The peasants, now supported by Warrior Monks, probed the woods in front of Lawrence. While all this was going on, I set an ambush against the curiously reticent Ikko-Ikki. Ian and Phil were now nearly ready to attack the village. Apart from the Ikko-Ikki commander, almost the whole monk force was pursuing Lawrence. ..who was feeling rather overfaced! ...our firing at long range though, was less than spectacular! Opposite me, the peasants assaulted my troops bravely, but were butchered. Phil's arquebusiers on the ridge were attacked by their targets! But as on my side, the peasants fled! Some arquebusiers from the village turned from pursuing Lawrence to face the massed Samurai, but were screened from shooting by their own sides routers. The cavalry from Phil's force galloped through the village and attacked them! Lawrences cavalry, meanwhile, had to gallop hard to avoid the attacking Ikko-Ikki! ..but their brave defence allowed the infantry to reach a defensible hill. Seeing the Samurai cavalry struggling in the battle with the Ikko-Ikki missile troops (they were poor quality samurai), I hurried to assist them. Lawrence reached the hill safely, and dismounted his Samurai. My naginata men began chopping up the missile troops fighting the cavalry, so my other men moved to support Lawrence. ..who was facing the main body of warrior monks alone. Ian's massed armoured force, meanwhile, had entered the town and were attacked by the Ikko-Ikki commander and his bodyguard. Despite fiercely fighting, the Ikko-Ikki commander died beneath the sword of a Samurai, along with most of his men. The missile troops in the town were finally overwhelmed. The death of the Ikko-Ikki commander, and the advance of the Samurai from the village, finally persuaded the warrior monks facing Lawrence to leave the battlefield. The game was not as bloody as most of our Samurai games, mainly because most of the warrior monks were running round the battlefield instead of fighting! The Ikko-Ikki were being run by one of my solo systems, and as it was designed for an attacking force, was very vulnerable to players baiting the defending troops of the town out. I think in future, I will give a defending force a perimeter to defend, where troops that cross the perimeter will immediately fall back to the village the turn after. This might make the defenders more difficult to defeat! A Berdan the hand is worth two in the bush?